On July 15th UNISON Cymru/Wales will be hosting a public meeting in Cardiff where the guests of honour will be Rene Gonzales and Gerardo Hernandez of the Miami Five. Many UNISON members will recall the plight of the Miami Five who spent almost 16 years in jail in the USA. 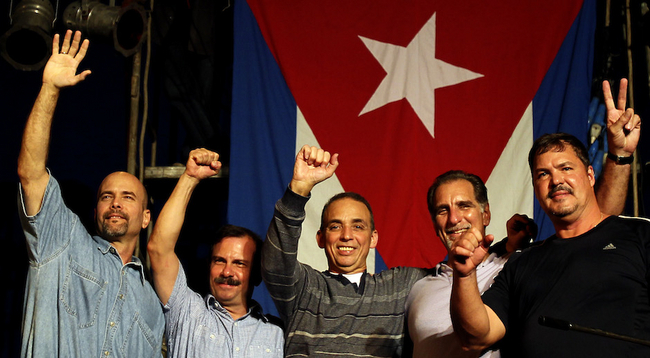 The Five Cuban patriots were gathering evidence of anti Cuba terrorist plots in Florida when they were arrested on trumped up charges and following what many people consider to be an unfair trial, left to rot in an American prison. UNISON and our members played a significant role in highlighting the injustice that they suffered and ensured that they were not forgotten. This was a campaign supported by many other Trade Unions and pressure groups. After the slight thaw in Cuba/USA relations in 2014 they were all finally released. Since then, efforts have been focussing on making arrangements for them to visit the UK and to thank all the Trade Unionists and campaigners who worked so tirelessly over the years to secure their release. Initially the requests for visas to be issued were turned down by the Tory Home Secretary Theresa May. This was successfully challenged in the High Court in Dec 2015. Two of the Five will be visiting Cardiff on July 15th where they will address a public meeting in City Hall at 12:00. It is anticipated that this will be a well attended meeting. Friday 15 July – Hamilton House, London, 6.30pm. Entry to all events is free.